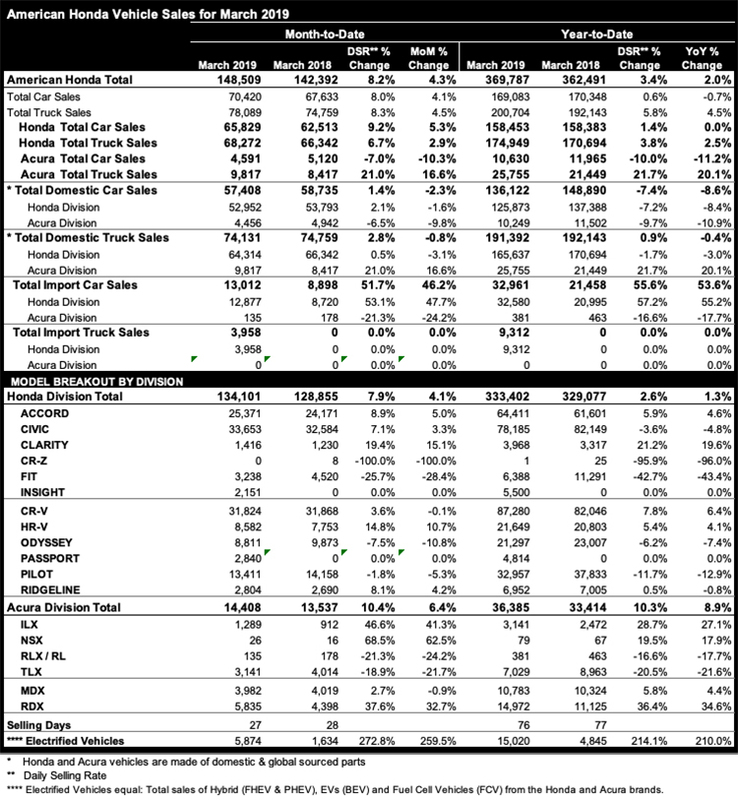 Honda’s record March sales was led by Accord and Civic, as Honda cars were big contributors, even as trucks also set a new March record with strong sales for HR-V, CR-V and Ridgeline. Civic, the retail car sales leader through February, rose 3.3% on sales of 33,653 units for a new March record. Accord gained 5% on sales of more than 25,000 units for the month. HR-V set a March record, gaining 10.7% on sales of 8,582 units. Ridgeline sales were up 4.2% in March, on sales of 2,804 units. Electrified vehicle sales totaled 5,874, with notable gains from Insight, Clarity PHEV and Accord. Honda CR-V and Civic are not only the retail #1 CUV and #1 car in America they are the #1 and #2 models in the industry, excluding full-size pickups. IIHS awarded the 2019 Honda Ridgeline a TOP SAFETY PICK rating when equipped with optional front crash prevention and specific headlights, the only pickup truck tested by the IIHS to earn this rating. Acura sales continued strong momentum with its best March sales in five years, rising 6.4% as the brand completed a strong first quarter. Driving the gains were ILX, up more than 40%, and RDX, which set a new March record. ILX jumped 41.3% on sales of 1,289 units, while TLX sales of 3,141 marked its best month since March 2018. RDX sales increased 32.7% in March, on the way to setting a 10th consecutive monthly record on sales of 5,835 vehicles. MDX maintained a strong pace with sales of nearly 4,000 units. MDX is posting solid gains over 2018, heading toward an 8th consecutive year of 50,000 units or more -- and remaining as the best-selling 3-row luxury SUV of all-time. TLX is outselling key competitors including the BMW 3-Series, Audi A4 and offerings from Lexus, Volvo, Alfa Romeo and Cadillac. What to expect at NY auto show?